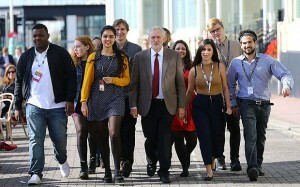 Comments Off on “Youth Flocks To Corbyn”…..ROTFLMAO…. The kids will keep the Red Flag flying…. Mr Corbyn will thrive, his supporters say, thanks to new support from disaffected young people, and non-voters. “What we have is a huge number of young people, very enthusiastic and brimming with ideas,” he told the BBC during Labour’s leadership campaign. Here we go again – the perennial myth of millions of “young people” on fire with radical leftie ideas, suddenly leaping into the streets inspired by a superannuated beardie from a wealthy family who has never had a real job in his life. Corbyn is the most recent of a line of PR puffed celebs who have been proclaimed heroes of “yoof” by a bunch of 40 something media hacks who still like to think they are down in the street with the kids….or should it be kidz? Billy Bragg was the classic example. A marginally successful folk/rock leftie in the 80s he was for years adopted as a mascot by the Beeb, often the first port of call for a “yoof” soundbite. Naturally these quotes were almost always fierce denunciations of the “Thatcher Regime”, grist to the mill for the Oxbridge middle class radish revolutionaries who filled the BBC corridors and studios, imagining it to be a reincarnation of the battleship Potemkin. The tirades kept on coming and the demos marched down the streets with camera friendly placards – and the Tories kept on winning elections. Fact is Bragg and the other “yoof” voices only ever spoke for a small segment of the art college/student union gesture politics brigade. They certainly had zilch impact on the kids in the bog standard comps where I taught in the 70s/80s/90s. Indeed, digging down into the world view of the those young people the majority were very conservative in their views. For all their surface bluster they tended to be big on family, recognised the value of getting a job, had fairly harsh views on what should be done to criminals and were modestly patriotic. “Yoof” protest stories are almost always classic examples of over egging the pudding by media hacks who need to pad out a few square inches to justify their expenses and the “Young Corbynista” is yet another chimera produced by thei fevered imaginations.